Built for publishing company Denise Rich Songs LLC in Ms. Rich's personal penthouse overlooking central park, this studio is based around a 24-channel Solid State Logic AWS 900+ console and Apogee digital audio interfaces (endorsements from both companies were secured). The room features a floated floor, custom cabinetry, assorted vintage outboard gear, and soffit-mounted Genelec 1032a monitors. Mike oversaw the design, construction and wiring of the entire room, which was fortunate enough to grace the pages of Mix Magazine and host legends like Patti Labelle, Natalie Cole, Dionne Warwick, and the Jonas Brothers. Built in a 19th century warehouse in Red Hook, Brooklyn, the entire studio sits on a floated 4-inch concrete slab suspended on rubber shock-absorbers. The walls are constructed "wall-within-a-wall" style, and the ceiling hangs on isolating springs, completely decoupling the recording area from the industrial spaces around it. The room was designed with one isolation booth, but without a separate control room so the producer/engineer must share the space with the musicians, eliminating any feeling of artificial separation or sterility. The equipment includes Avid's Pro Tools HD3 with Avid Artist Series controllers, Apogee digital audio interfaces, vintage Neve and API mic amps, and Focal Twin 6b Monitors. Also conceived with the "no-control-room" philosophy, this Brooklyn room started off as a bare, concrete, industrial loft. Using acoustic treatments and smart design elements with an absolute minimum of construction, the reverberation time was tamed, and the room was tuned to startling accuracy. 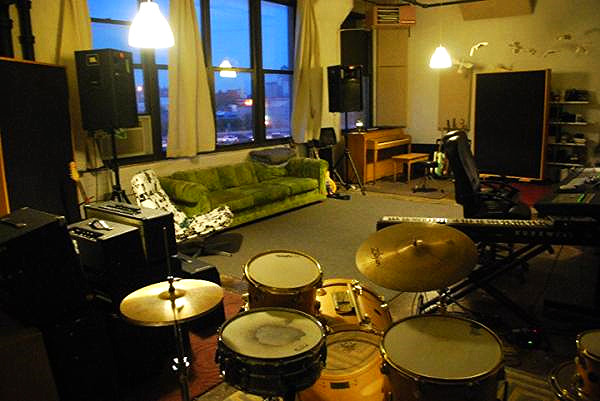 Used as a tracking and mixing room as well as a rehearsal studio, large moveable gobos help create customizable sonic environments in different sections of the room. This studio was also built around Avid's Pro Tools HD 3, and several inspiring vintage instruments, mic amps and microphones.